Why doesn't Google update every Pixel at the same time? One of the most important promises Google makes about Pixel phones is immediate access to the latest Android software updates. Yet practical experience shows that’s not always the case – and both Google and US carriers are to blame. Take last week’s Pixel 2 patch. After users complained about dull colors caused by controversial color calibration, Google announced it was rolling out an OTA (over-the-air) update that would allow users to set their colors to a hyper-saturated mode more typical of AMOLED displays. Though the update isn’t perfect, it was an encouragingly swift response by Google. Not long after the announcement, some Pixel 2 users around the world began to receive the update. 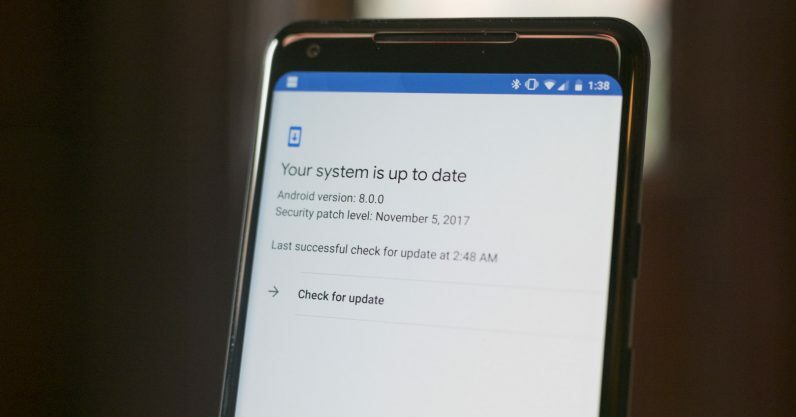 Nearly a week after it first began to roll out, many Pixel 2 XL owners have yet to receive the update. This primarily seems to affect T-Mobile and Project Fi (a Google-owned carrier powered by T-Mobile and Sprint) customers. As explained by this excellent Reddit post (and confirmed to us by Google), US carriers have to approve updates for devices running on their network – even though the phone is only sold in Verizon Stores. Basically, carriers want to make sure the updates don’t break compatibility with their own features like Wi-Fi calling, so the Pixels check which carrier you’re on. (This only appears to apply to feature updates, not security patches). Once you’ve inserted a SIM, the Pixels will associate your phone to a specific carrier, and only deliver updates that have been approved by said carrier. Occasionally, they’ll even download specific builds for those carriers, even though functionality is essentially identical. Case in point: if you’re carrier is blocking an update download on your Pixel, all you have to do is remove the SIM and perform a factory reset. The Pixel will then be able download the latest update, and after that’s done you can put your SIM back in. Google won’t revert you to an older build, even if the new build hasn’t been approved by the carrier. In fact, it seems that usually all you really have to do is simply swap out your SIM to another carrier’s – even if that SIM is no longer active. On my own T-Mobile device, popping an inactive Verizon SIM immediately did the trick: the OTA showed in System Updates. Putting the T-Mobile SIM back in made it disappear. That’s all a little disappointing, even if the update should be out for everyone within the next few days. After all, one of the primary reasons for getting a Pixel phone is being able to get updates as soon as they come. Waiting a week may not sound all that bad, but it still runs counter to that initial promise. Considering the issues plaguing the first batch of Pixel 2s, a timely update could be the difference between a user keeping their phone or exchanging it for something else. It’s also worth noting this delay is neither the first nor the worst I’ve seen from Google’s own devices; I sometimes had to wait weeks for Nexus devices to get updates over the air for the same carrier-related reasons. It’s fair that carriers want to make sure updates don’t break any of their services. And if you’re impatient, more advanced users can simply sideload OTAs through some command-line via ADB (or use the aforementioned SIM tricks). There’s an excellent guide on how to do so here ( though proceed at your own risk). But I really shouldn’t have to go through such circuitous methods for a device that’s supposed to represent the best software experience on Android. I expect that from other Android devices, but not from the Pixels. After all, carriers have to approve Apple’s updates in the same way, yet iOS updates arrive for everyone at the same time. If anything, Apple actually manages to build some hype around small updates because they become mass events. Of course, even Google can’t match Apple’s smartphone clout, and chances are the latter gets the highest priority for OTA approvals from carriers. But I can’t help but feel Google could handle updates a little more seamlessly, ideally by pressuring carriers for faster approvals. If that’s not possible, other options include timing the OTA updates so that everyone gets them at the same time, making it easier to sideload them, or being more transparent about why these carrier-related delays exist. Point is, the Pixel is supposed to be team green’s choice for the latest and greatest Android software experience. Though the Pixels may be far better than most other phones in this regard, making some of its most ardent users wait even a few days still puts a damper on that image.